Musical instrument makers build and repair musical instruments such as pianos, string instruments, organs etc. according to traditional methods. Perform an expert evaluation or valuation of a musical instrument, e.g. 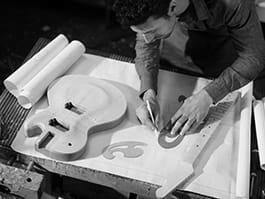 assess the date of construction and the builder of instrument, and estimate costs of making or repairing instruments for clients. Restore antique musical instruments using various techniques. Reassemble instruments after repair, e.g. using hand tools, power tools and glue, hair, yarn, resin or clamps, and lubricate instruments as necessary. Repair instruments using synthetic or special materials, such as ivory or horn. Repair cracks in wood or metal instruments using pinning wire, lathes, fillers, clamps or soldering irons. Polish instruments using rags and polishing compounds, buffing wheels or burnishing tools. String instruments and adjust trusses and bridges to obtain specified string tensions and heights. Build musical instruments using various materials, such as metal, wood, synthetic and special materials (e.g. ivory, horn).